HEY! You're part of it! I am wired on coffee (a mocha from Alliance Bakery). Z and I got up early and got to our polling place a block from our house at 6:30am. Between waiting in line to voting it took an hour. Then we went to Alliance and got to work early (8:30). A lot of Chicago businesses are closing at 3pm to clear the city for all of those people who are going to come into the city for the rally. I had an opportunity to go with Jenny, but I turned it down for a number of reasons. Originally I was really psyched to go, but I will be just as happy to watch it on tv at Eliza's methinks. I love my city. Love love love it. I made a new RWT card yesterday. I came up with the idea for the text inside first but then needed to come up with a good idea for the drawing. 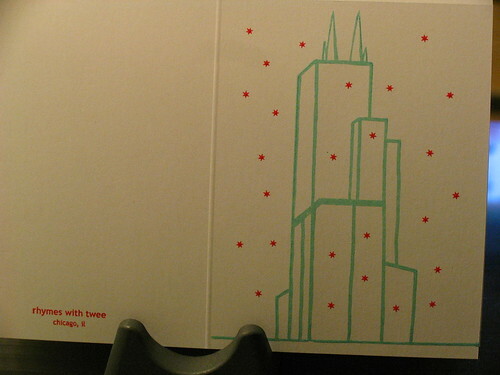 Originally I was going to draw a Chicago landmark with a flag on it, but then I went with Sears Tower with tiny little "snowflakes" that are actually the stars from the Chicago flag...is that what it looks like to you?!?!? The chorus of this song is in my head this morning because I AM A PART OF IT. YOU ARE A PART OF IT. VOTE VOTE VOTE! Tonight we will know who our next president is. Hope upon hope it will be Obama. Yeah! you're part of it! I walk the streets of a Carolina. Watching people pushing shopping carts. And there's a guy above me and he's washing windows. Well have you heard that this country is unequal still. History continues itself, continues itself. And I did not create the rules. This place has broken my American heart. I'm so excited... I feel like there's so much good energy swirling around in the city today. Yay Obama!! I had to look up the Chicago flag--it's awesome! As awesome as your card! turned back the clocks in my room; i needed time! We were at the polls this morning at 6:00, just in case. At first it didn't seem like there would be a crowd, but at 7:00, when the polls open for Florida, it was crazazy. I was so excited, I couldn't drink coffee today! Today is a good day in our history. I hope tonight I can say an amazing day. I love that new card! 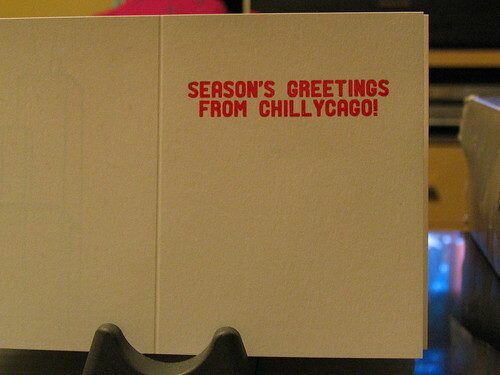 If I send out Xmas cards this year, I'm using yours! Also, I am a giant ball of anxiety right now. We did it!!! I'm really glad you came over tonight!